15 of us assembled at Richmond station for a walk around this lovely riverside area, ably led by John Wray. Fortunately the weather was dry and we didn’t encounter much mud. We walked to Richmond Green and saw what remains of the royal palace, before finding a new way down to the river. 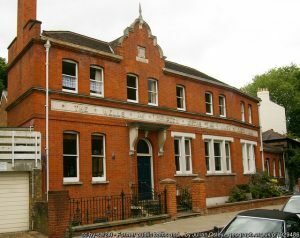 We then ascended Richmond Hill to the ex-Star and Garter servicemen’s home, wondering why the nearby nurses home was derelict, when we spotted a huge crack in the building! Clearly good foundations are essential around Richmond. We then walked down to Petersham and along the Thames path back to the White Cross pub. We had laughed at the sign indicating the entrance to use when the Thames was in flood, but by the time the last of us left the pub after our festive drinks at 4.30pm, the tide was washing up nearby! Members of the Group met at Tower Hill Station in bright sunshine anticipating a walk along the Thames to Wapping and beyond. 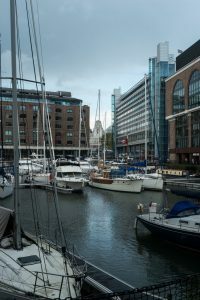 Any hopes of completing the walk received an early set back in St Katharine’s Dock when, contrary to the weather forecast, the heavens opened. After sheltering for a time, the lure of coffee and cake became irresistible, so much so that when the walk resumed, the party of walkers was depleted. Wapping is an early exercise in urban gentrification: the Victorian warehouse buildings have been converted into flats and discrete restaurants, and an estate agent or two. It all seems a little lifeless. Along the riverfront are a series of new residential buildings with splendid views over Rotherhithe and Canary Wharf. The group came across a few interesting traces of the old Wapping – the Georgian Pier Head, the tower of the bombed St John’s Church, the blue-coated figures on the facade of Old St John’s School, and of great interest to those interested in industrial archaeology, the former Wapping Hydraulic Power Station, which following its closure, was for much of the early 21st century an arts and restaurant centre before its closed in 2013, some say, because the noise irritated the neighbours in their warehouse conversions! Nearly opposite this building stands the Prospect of Whitby public house, and here the walk terminated with drink and conversation before the journey back to North London. Limehouse and beyond will have to wait for another day! Blessed with a crisp, sunny, autumnal day, a record 23 of us strode out across Hampstead Heath. We soon departed from the tried and tested paths and intrepidly crossed the Spaniards Rd into the woodlands of Sandy Heath, ostensibly to see some autumnal colour but, the season being so mild, the trees were not yet ready for a big display. 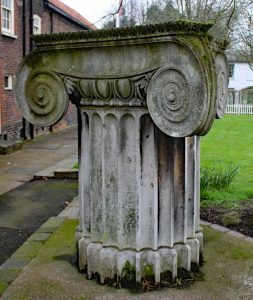 We arrived at Golders Hill Park and had a pleasant time in the sun exploring the grounds and taking refreshments at the cafe there, before setting off through the woods of West Heath and finding the pergola of the Hill Garden, a wonderful relic of faded grandeur. Now at Jack Straw’s Castle, we dispersed – some to walk back across the Heath to Kenwood, some to catch the 210 home, after discovering some of the lesser known areas of a familiar old friend. 21 of us set off from Tottenham Hale in glorious sunshine to explore the Lea Valley Walk down to Three Mills. Most of the group left at Hackney Wick, but some of us pressed on past the Olympic Park down to Bow and the beautiful Three Mills. It was much warmer than we expected, and not so many bicycles as on the Regent’s Canal. We were surprised by the wide open landscape of the Walthamstow and Hackney Marshes, and intrigued by the history of the Avro aircraft firm, one of the first to achieve commercial success. All along the Lea there is increasing evidence of gentrification as more apartment blocks are being built, but also of a thriving canal boat community. Members of the Group at Ladbroke Tube station, and headed south to the Portobello Road area. We passed a Serbian church and community centre then, at 240 Portobello Road, a Japanese restaurant, formerly a very large pub (Shannon’s Market Bar), now very exotically decorated. Our first stop was at Tavistock Road where we saw two plaques to the ladies who founded the Notting Hill Carnival and a row of multicoloured houses. Across Acklam Village market we saw Trellick Tower, wrapped in scaffolding for renovations. On the wall of the Canada Blanch Spanish School were lovely cartoon depictions of people and places of the area by Fiona Hawthorne. The Portobello area has many Spanish connections and a huge mosaic commemorating locals who fought in the Spanish Civil War. 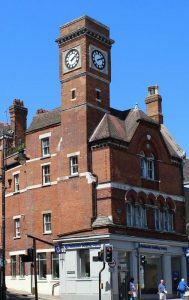 Among the many colourful shops selling hats, jewellery, food and much more were the Electric Cinema and the antiques markets founded by Susan Garth who has a blue plaque on the Red Lion building. Then to Kensington Park Gardens, a very posh area of huge houses and apartment blocks. In one, no. 7, lived Sir William Crookes, a chemist and physicist. Some apartment blocks had archways and iron gates to their rear communal gardens. Others had lovely iron railings and balconies. One had a built in bootscraper. From Lansdowne Rise we could see the ruins of Grenfell Tower. In Clarendon Road we saw terracotta pots in profusion reminding us that the area was once known for its clay, brickfields and potteries. At the back of Hippodrome Mews (there used to be a racecourse in the area) is an old kiln attached to a house. Next came Norland Square and Norland Place. Norland Nannies started in Norland Place 125 years ago. The Norland Estate includes Norland Place and Square and was 52 acres when laid out in 1839. Between the homes was a remnant of former times – Queens Dairy at 7 Queensdale Road with a lovely old shop sign. In Holland Park Avenue is a wonderful old butcher’s shop, Lidgate, with lovely tiling. By now were all in need of rest and refreshment. Some of us went for tea, coffee and cake and then on home. After meeting at the Angel station Helen Bembridge took us, via Boris Johnson’s house, to visit a house in Noel Road where she had lived as a student. It was a house that had been owned, or lived in, by various interesting people, including Paul McCartney. We then joined the Regent’s Canal for the rest of the walk. The canal is lined with buildings which include old warehouses, some converted for work or living spaces, new apartments, some more affordable than others, and social housing. We stopped for lunch at the now very fashionable Broadway Market with its profusion of places to eat and drink. After leaving the market we passed Victoria Park, a welcome green space developed in the East End in the 19th century. We crossed a humpbacked bridge over the entrance to The Hertford Union Canal which leads to the River Lea Navigation. The canal then passes a green space in Mile End which includes a “green bridge” over the Mile End Road. Beyond this is the Ragged School Museum which was founded by Dr Barnardo and includes a reconstructed Victorian classroom. Shortly afterwards we came to Limehouse Basin after passing under two railway bridges of historical interest. There is also the entrance to Limehouse Cut, which leads back to The Lea Navigation, and views of the Thames. A smaller group than usual, due to holidays and last minute problems. We enjoyed a lovely ramble through Trent Park, which had a lot more footpaths through woods and over fields than the rest of the group was aware, so thanks to Sally for careful preparation. The weather was perfect for walking, slightly overcast, with a bit of a breeze. We started from Cockfosters and Sally showed us how to walk along a footpath to enter the Park and enjoyed some scenic views over a field (was this really Enfield?) before having a cuppa at the Animal Sanctuary hut. We planned to visit Trent Park cafe for lunch. Only hitch—a half hour wait for sandwiches for a group of 6, so we enjoyed the much more efficient service at Cockfosters cafe instead! 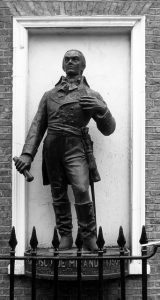 Luckily, the weather was much more refreshing than of late and Philip took us to Fitzroy Square, pointing out the plaque to Virginia Woolf, and then the statue of Francisco Miranda, the 18th century liberator of South America. 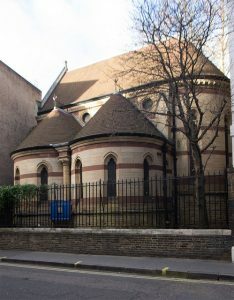 We went down Charlotte Street towards the new development which has replaced the old Middlesex Hospital, and we were all charmed by the Fitzrovia Chapel, the only part of the hospital to survive. 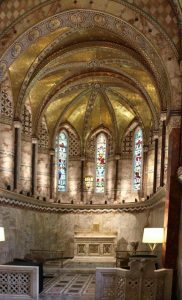 Built at the end of the 19th century in a Byzantine style, the chapel is open on Wednesdays and hosts lunchtime events one Friday a month. 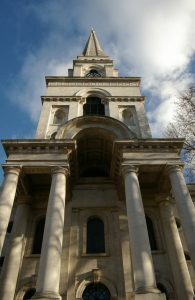 After that we walked through to Russell Square and down towards St Georges Bloomsbury, a Grade 1 listed church by Hawksmoor, with the most curious church spire in London- George I sits on the top! 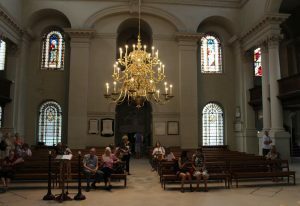 We visited Bloomsbury Square and had tea at St Georges, Holborn, in Queen Square. Some of us then went on to look at the Foundling Museum before ending the tour. A 15 minute train ride took us to Gordon Hill, the start of our walk around the environs of Forty Hall. Fortunately, much of the route was in shaded woodland following the course of Turkey Brook, as it was one of the hottest summer days yet. We stopped for lunch at the Forty Hall cafe in the shade of some of the wonderfully aged trees and took some time to wander around the walled garden before completing the circle back to the station… all of us dreaming of long drinks and cold showers. 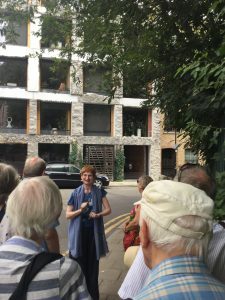 Ten of us braved the tropical heat and headed for Farringdon where we met with our excellent ‘guest guide’, Karen of Lansdown’s London walks who led us through the many unexplored lanes, passageways, squares and crannies of Clerkenwell, enlightening us with its fascinating history. In the 17th century, Clerkenwell was outside the City of London and so was colonised by communities such as the Huguenots seeking refuge from persecution, bringing with them numerous skills such as watchmaking and jewellery, remnants of which still remain. The presence of plentiful sources of water and proximity to London town led to the establishing of many breweries and distilleries, now of course, converted to luxury apartments. Even today, the area retains its reputation as a creative hub, opening the doors of its many architects, furniture designers and jewellers during the annual Clerkenwell Design Week, a wonderful legacy of its roots as an ‘outsider’ village. 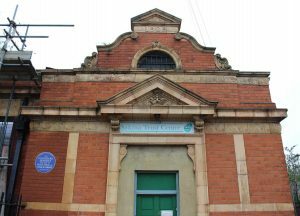 The Wells and Campden Baths and Wash Houses, an impressive 1888 Grade II listed building. 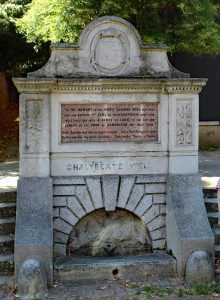 On to Well Walk where there is a plaque to Marie Stopes, and Chalybeate Well . In Willow Road some nice cottages and an old Metropolitan Drinking Fountain & Cattle Trough, now planted up. And a house with a red, white and blue roundel window over the door – an RAF connection? 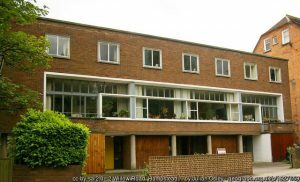 Then, at 1-3 Willow Road, the 3 Modernist, pre-WWII houses designed and built by Erno Goldfinger (No. 2 which is a National Trust property, but was not open). 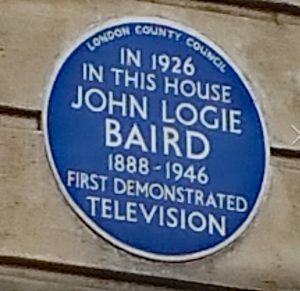 At 23 Downshire Hill was a plaque to the wonderful, female photographer Lee Miller (and her husband Sir Roland Penrose). Across the road was the lovely Grade I listed St John’’s Church. The last stop was the shady garden Keat’s House in Keat’s Grove It was here he wrote Ode to a Nightingale. We finished our most enjoyable walk at The Garden Gate pub in the cool garden with drinks and an opportunity to discuss the walk with each other, and to thank John for leading us so well. Edited from notes made by Lesley Ramm, with photographic contributions from Alison Miller and Angela Dawson. This walk was packed with things you may never have seen before and proved that it’s always fun being a tourist in the city one lives in, especially on a perfect sunny day. Who’d have thought Mayfair had a disused underground station and a Turkish barbers which we’re more used to seeing in Hoxton or Green Lanes? And have you ever chilled out on top of an electricity substation? Around 14 of us convened by the statue of Eros in Piccadilly. The first gem of information was that this memorial is misconceived. 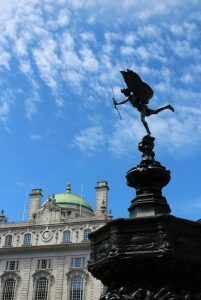 Eros is a god of love, yes, but it’s a statue to the memory of the philanthropist John Shaftesbury: a different kind of love would have been more appropriate for a memorial. We headed off after this to Piccadilly, first stop the Albany, a set of bachelor’s apartments or ‘sets’ with many famous real life (Gladstone) and fictional residents (including the wonderfully named Pongo Twistleton, a friend of Bertie Wooster). It was great to imagine all the characters and the goings-on. 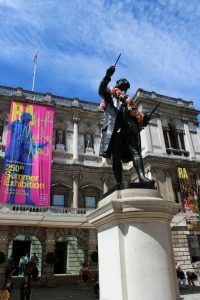 Next to the Royal Academy and a look at the buildings there and the statue of Joshua Reynolds, the first RA President. People asked whether Turner was an academician, but apparently he was too common to be allowed in. We then wandered along Burlington Arcade on our way to the Royal Institution. Did you know that Paul McCartney is the only person allowed to whistle in the arcade? Answers on a postcard please. None of us knew why. Shepherd’s Market next, a contrast to the designer shops, and a buzzy area with ‘real’ shops, cafes and the thriving barber’s, certainly more patronized than the famous Trumper’s, which was completely empty when we had a look in. We then came across the disused Down Street underground, and Crockford’s Gambling Club, still open today. By this time the heat was starting to get to some of us and it was wonderful to come across Mount Street Gardens, shady and calm with the Farm Street Church nearby. Time for a welcome tea-break, which we had in an elegant and classic Viennese-type patisserie. We also saw the beautiful Ukrainian Church from the chilling area (Brown Hart Gardens) on top of the electricity substation on Duke Street, as well as what looked like social housing, a great contrast to the splendour and a reminder that there can be diversity in such an affluent area. Grosvenor Square brought back memories of rallies and demos for many of us, and Hanover square was also a pleasant respite from the heat before we made our way back to the tube. Philip showed us so many things on this walk. I hope we can run it again. Reports by Jeannie Davidson and Lesley Ramm. 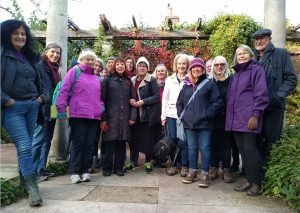 For many of the members of the Group, our latest walk, led by Sally Geeve, was new territory indeed, quite a contrast from leafy Crouch End and Hornsey. What were we up to? Following the Line Sculpture Walk … , but there was so much more to see besides. We met at North Greenwich Station and followed the Thames River path on the perimeter of the O2 Arena, stopping to admire a series of artworks by Alex Chinneck, Thomson & Craighead, Richard Wilson, Gary Hume, and Anthony Gormley. Back north of the river made our way via the DLR and a rather unattractive industrial estate, we stopped for lunch at Cody Dock, a wonderful oasis of plants and community activity. Resuming the sculpture trail we soon encountered a Damien Hirst and further on admired a tower of shopping trolleys (created by Abigail Fallis) reclaimed from the Lea, and appropriately sited adjacent to a Sainsbury logistics centre. 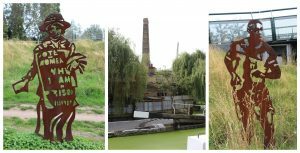 The final leg of the walk took us past the historic Three Mills Island, and onwards past two more artworks – the Three Mills Green Memorial, and “Network” by Thomas J. Price. 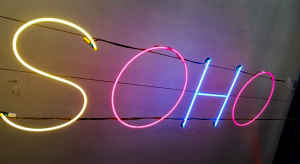 About 20 members joined Philip Messent on a walk through historic Soho, starting at the Dominion Theatre and ending at Piccadilly tube station several hours later. In this very small area we heard tales of high and low life, Royalty and crooks, musicians, and comedians, and saw a number of commemorative plaques, featuring, among others, Mary Seacole, the Jamaican nurse “Heroine of the Crimea” – she has a ward named after her in the Whittington Hospital, comedian Peter Cook, Mozart, John Logie Baird, essayist William Hazlitt, botanist Joseph Banks, David Bowie, health campaigner Dr John Snow, and landscape architect Charles Bridgeman. In Greek St we were very lucky to be invited into the House of St Barnabas, a charitable foundation with its own small church , where the Rev Dr Adam Scott, a direct descendent of the Monro family involved in St Barnabas, gave us a talk. Then on to Soho (formerly Kings) Square with many fine buildings on each side including St Patrick’s Catholic Church. In the square we saw the Tudor looking building which was only built in 1925! Originally a disguise for an electric sub station it is now used to store gardening equipment. We went down Romilly Street (home to Kettner’s Townhouse hotel, an historic Georgian building, Frith Street past Ronnie Scott’s Jazz Club, The Arts Theatre Club, noting that a No. 14 there was a gap between buildings, probably from a WWII bomb in the area. There is now a single storey building Garlic & Shots. 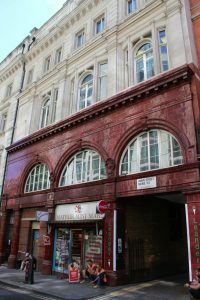 At the rear stage entrance of the Prince Edward Theatre was a sign – The London Casino. It says The Worlds Greatest Artistes have passed and will pass through these doors. In Old Compton Street we saw G-A-Y, the site of the former 2 I’s Coffee bar where Cliff Richard and Tommy Steele were discovered, and the Admiral Duncan pub where in April 1999 a nail bomb killed and injured many people. 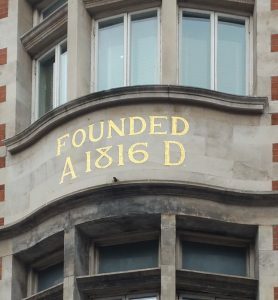 After a break for refreshments in the Soho Theatre bar, we investigated Dean Street including the Kemble House apartments, decorated with plaques illustrating sailing ships, the former Royal Ear Hospital building, with year AD 1816 in mosaic. Then on to St Anne’s Church, Brewer Street Market and finally Broadwick Street, and Carnaby Street. This was another wonderful historic walk led by Philip and we look forward to future walks. This text is based on an account prepared by member Lesley Ramm. Her images illustrate the text. 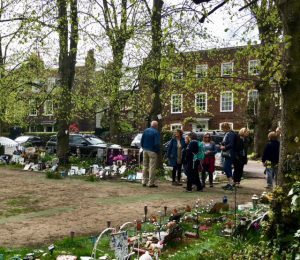 Around 20 of the Shorter Walks Group were blessed with perfect walking weather for our guided walk around Highgate Village. We visited the newer estates of Hillcrest and Highgate before seeking out some of the poets of Highgate, from A.E. Housman to the latter day bard George Michael, whose shrine is now so visible in the centre of the Village. But we also took in Andrew Marvell, whose lovely sundial poem is displayed below, as we ended our walk at Lauderdale House and Waterlow Park, donated by Sydney Waterlow as a ‘garden for the gardenless’. 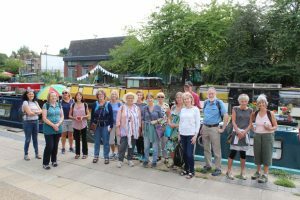 The Group had a really enjoyable walk around Walthamstow Village, which was unknown to us in Crouch End and Muswell Hill. 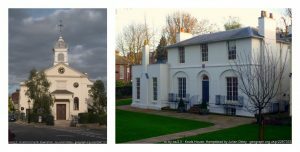 The photos show the range of buildings, from St Mary’s Churchyard to the old Walthamstow Town Hall. We had tea and a chance to look round the William Morris Gallery as well. For once, it did not rain! Fragment from the General Post Office building that once stood in St Martins-le-Grand near St Paul’s Cathedral. The building, designed by Robert Smirke (architect of the British Museum), was demolished in 1912. Former Walthamstow Postal Sorting Office, built in 1903. Walthamstow Town Hall, built in 1941 to a design by architect Philip Hepworth. 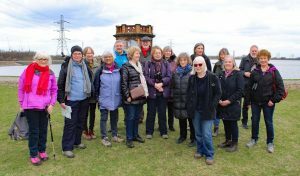 Blessed with a sunny spring day for outing to Walthamstow Wetlands and accompanied by an excellent guide from the London Wildlife Trust, we began with refreshments in the beautifully restored Engine House. Walking in a figure of eight over about 4 miles, we learnt about the history and construction of the 10 reservoirs whilst enjoying the views of the semi-industrial landscapes seen over great expanses of water, reed beds, and cormorant-filled islands. A wonderful place to get away from the city – only a few minutes tube ride away. We were lucky enough to have a rare sunny afternoon for our outing to Woodberry Wetlands, walking along a very muddy New River Path from Finsbury Park to arrive at the East Reservoir, where we had tea at the Coal Hole, before proceeding to the West Reservoir and viewing the extraordinary castle pumping station, built by Mylne for the New River Company. We had the pleasure of a local expert, Nick Higham, who gave us really useful background to the creation and adaptation of the New River, and the successful 1980s campaign to save the reservoirs. 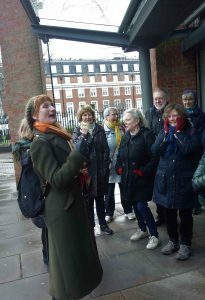 The Shorter Walks group enjoyed a fascinating walk around Spitalfields and Whitechapel, despite some threatening rain clouds on 29 January. 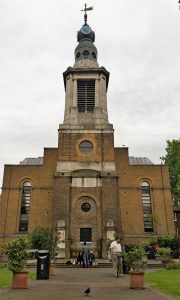 Philip Messent showed us 17th century houses, a mosque which had previously been both a church and a synagogue, and a former Rowton Houses hostel, as well as enjoying a delightful tea in the Crypt of Hawksmoor’s Christ Church across the road from Spitalfields Market. Other highlights of the walk included the Kindertransport Memorial Sculpture at Liverpool Street Station, Artillery Passage, Sandy’s Row, Tracey Emin’s former warehouse home, the Soup Kitchen for the Jewish Poor in Brune Street, Spitalfields Market, Huguenot residences in Fournier Street, the Brick Lane Mosque, and Altab Ali Park in Whitechapel, and the Royal London Hospital. 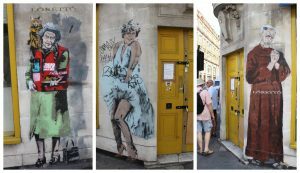 Expertly led by qualified Clerkenwell and Islington guide Karen Lansdown, we were taken on a tour of central Islington, with some familiar sights and surprises. 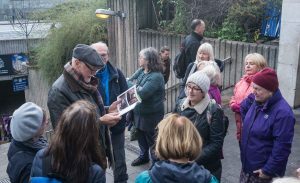 The theme of the walk was Islington’s relationship with water, beginning with the Regent’s Canal (tunnelled under Islington itself), the historical course of the New River (well-known, of course to residents of Hornsey). We went into the public spaces of Sadlers Wells Theatre, to inspect The Well (unfortunately not illuminated), admired the buildings and landscaped grounds of the former headquarters of the London Metropolitan Water Board, and shown a series of carvings on a perimeter wall in Myddelton Passage – by, it turns out, members of the Metropolitan Police! Our tour ended in Claremont Square, opposite the extensive reservoir, covered in the 1850s. We were indeed lucky that yet another watery feature, the rain, held off, and we left the Angel after 90 minutes of fascinating history and thinking of Charles Lamb’s friend who fell into the New River in the days when it ran in front of his house in Colebrooke Row.